B2B Yes you can! Danisco shows how. 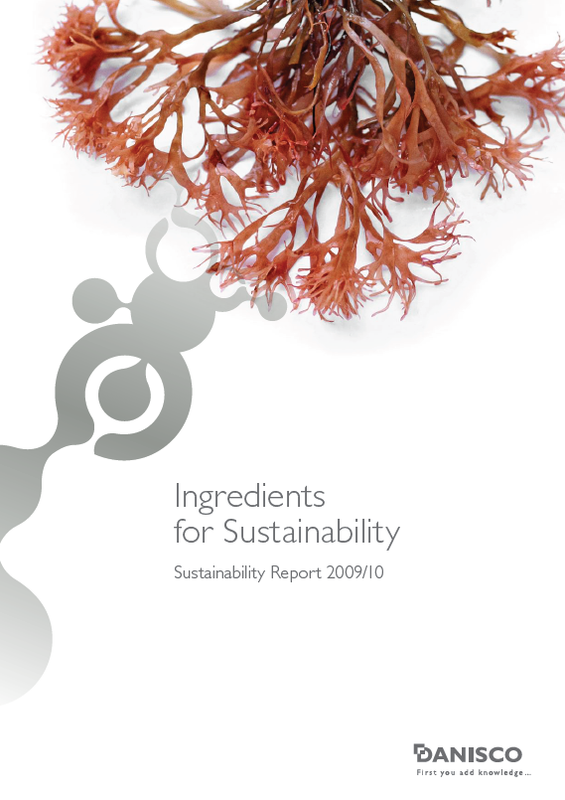 It is quite a pleasure to write about a recently published Sustainability Report - this time from Danisco, the Danish bio-based food ingredients supplier. It is a pleasure not only because the Danisco report is somewhat different from most of the reports you will see flying around these days, but also, because, by way of disclosure, I supported Danisco in the development of this particular report. Don't get me wrong - Danisco did all the hard work - I came in at the back end of the process to offer some specific assistance to the reporting team. Anyway, let me tell you a little about Danisco and their 2010 Sustainability Report. Danisco uses raw materials from nature and transforms them into ingredients which contribute to the improved sustainability of our lives - mainly ingredients which improve the quality and health properties of what we eat, but also of things we wear, drive, use and interact with in many different ways. In fact, I had been familiar with Danisco as a food ingredients supplier - I had no idea of the wide range of applications their products can serve. Danisco is based in sunny Copenhagen, Denmark, employes 6,800 people, and operates from over 49 manufacturing sites around the world. Danisco’s ingredients are used globally in a wide range of industries including bakery, dairy, beverages, animal feed, laundry detergents, tyre manufacture, and bioethanol. Danisco's Sustainability Director, Jeff Hogue, is a frequent social-media-ite and tweets as @JeffreyHogue. The most significant thing about Danisco's sustainability impacts are that they are greatest once the shipments have left the plant. Many companies' significant impacts are indirect in this way. But Danisco's impacts are two degrees removed - first they sell to manufacturing businesses, then the manufacturing businesses sell their brands to the final consumer. So, although Danisco might not be a household name (well, except perhaps, in Copenhagen), Danisco makes a far greater impact on our lives than you might guess, doing so through the way the Company develops innovative technology and new products, and supports and collaborates with its customers who make the end products we consume. Take bread, for instance. Danisco tells us that "In the UK alone, more than 320,000 tonnes of bread is discarded each year because it has lost its freshness. Methane produced by that waste equates to more than 1.4 million tonnes of CO2 equivalents." Addition of Danisco enzymes can help keep bread fresher up to seven days longer, potentially saving two million tonnes of flour per year and making more bread available with no increase in flour. In the UK alone. Think of that as applicable worldwide. Big numbers. How many times have you thrown out bread that became stale and unappetizing ? It happens, right ? Danisco doesn't make bread. But through Danisco's work with bread-manufacturing companies and bakeries, the consumers have access to a much more sustainable product and lifestyle. Another example? Take this story about milk in Kenya: " In 2007, worldwide milk production is estimated to be 655 million tonnes with over 30% produced in developing countries. The UN Food and Agriculture Organization (FAO) forecasts that demand for milk in the developing world will double by 2030. Developing countries are not self-sufficient with milk, and dairy imports to developing countries in value terms grew by 43% between 1998 and 2001.The vast majority of the milk in developing countries is produced on small-scale farms (fewer than five milking cows), without cooling systems. The FAO estimates that 25-50% of the milk from small-scale farmers is wasted." Danisco is working on a technology involving adding an enzyme to the milk at the point of production which would extend the life of milk for 12-15 hours without cooling - thereby avoiding most of the waste in this supply system. This development offers a tremendous economic, social and environmental benefit, a true sustainability springboard. Danisco does not produce milk either. As consumers, we are happily unaware of the positive impact on the sustainability of our lives that the Danisco range of products offer, yet we gain the benefit in many of our everyday consumption patterns. One final example of a super development is in the area of car tyre production - in a collaborative project with Goodyear, Danisco is developing a bio-based, renewable synthetic rubber for use in car tyres with an investment of $50 million, to support our move away from dependency on fossil-based fuels. Renewable car tyres. Danisco are not in the tyre business, but when you are taking your new hybrid out for a spin, you will be able to rest assured that fuel consumption is low not only in the engine but also in the road-grip. These examples represent the core "ingredients for sustainability" proposition that is the backbone of Danisco's sustainability strategy and 2010 report. Danisco's reporting squarely places these issues in context. Going way beyond the Company's internal, direct, impacts - and these are reported comprehensively (massive reductions in waste, total carbon emissions, water consumption and wastewater generation in the environmental sphere and significant positive workplace improvements including reduced accident rates etc,) Danisco's report addresses overarching challenges our global society faces in the run-up to 2050, where the global population will increase to 9 billion (from 6.8 billion) and will need solutions to food security issues, dependence on fossil fuels and petroleum-based chemicals, and growing health issues. Danisco explains the naure of these challenges, the associated risks, and strategy that Danisco has developed to adapt its core business proposition to support finding the right solutions - the right "ingredients for sustainability". As mentioned, I am entirely not impartial in relation to this particular Company report, though I spare you many other interesting aspects that I would have been pleased to mention (I know blog-readers have short-attention spans) but I hope this will not prevent you from taking a look at the Danisco report and pondering the broader issues we face as a society and the role that responsible businesses play, even those whose brand-names doen't jump out at us from the supermarket shelf or the car showroom. And when B2B Companies tell you that CSR doesn't apply to them because they don't produce consumer-facing brands, you can quote the Danisco report as absolute proof of the opposite. I was just looking through Bayer's newly published CSR Report and couldn't resist mentioning this, which jumped right out of the page (well, screen) and hit me in the nose (I can think of worst places to get hit). 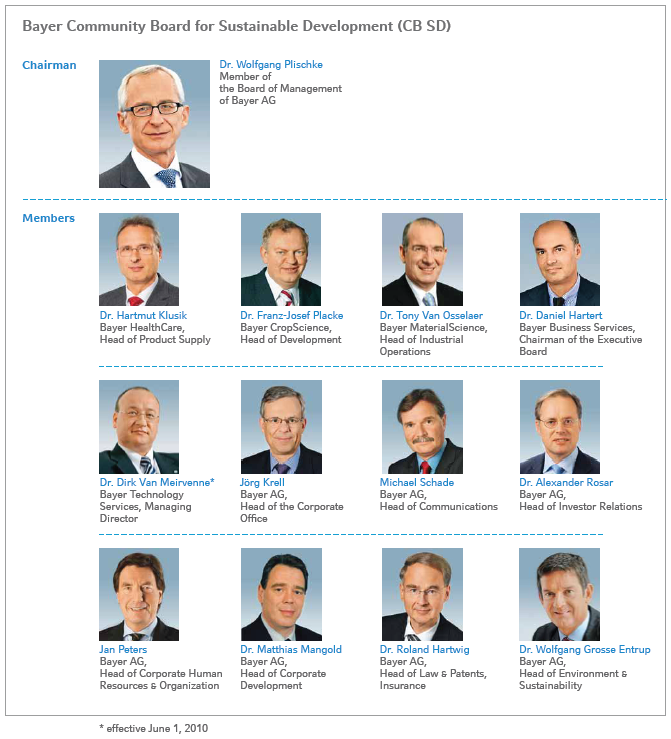 Yes folks, this is the Bayer Board for Sustainable Development. What do you notice ? Lipstick? Plucked eyebrows ? A little rouge around the cheekbones ? Not a chance. (Well, seems not). This entire 13-strong weak SUSTAINABLE NOT diversity-challenged team EXCLUDES women. Not even a little token woman to make the tea and serve the Chunky Monkey. Not even one of them that LOOKS LIKE a woman. Bayer report that "Fostering the employment of women is one of the central elements of our diversity strategy. At the end of 2009, the proportion of women in the workforce worldwide was around 35 percent. The percentage of female managers is rising steadily. In Germany, it is currently 24 percent across all managerial grades and nearly 30 percent at the junior management level, which is the entry level for future managers.Moreover, the proportion is rising. At the most senior management level, the Group Leadership Circle, the proportion of women Group-wide is 5.5 percent." Some diversity strategy. It stops at the glass ceiling, apparently. Bad, Bayer. Still, I suppose that's what you get when you ask for transparency. At least they didnt use Photoshop to make them all look female. This follows on from my post about Deutsch Telekom's 2010 Corporate Reponsibility Report and allegations of anti-union practices. As I usually do, because I believe we have a responsibility to dialogue with companies and engage with them on their reporting, I wrote to the Deutsche Telekom to ask for some clarification. You never know, perhaps it's all a storm in a tea-cup. My e-mail to the address indicated in the report bounced back. Dud e-mail address. It happens. 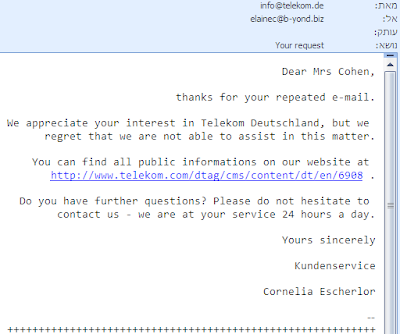 I then filled in the online form on the Deutcshe Telekom website. This resulted in a standard response advising me that they "appreciate my interest in Deutsche Telekom" and that I can find all "public informations" on their website. Frankly, I have nothing more to say. What is Deutsche Telekom's report worth ? I was disturbed to read about the criticism by its own employees of Deutsche Telekom's alleged unionbusting practices in the USA and commented on this in my blog on CSR and HR practices, with reference to Human Resources practices of this company. Clearly, this backlash was timed to conincide with the publication of Deutche Telekom's 2010 Corporate Responsibility Report , announced earlier this week, and forms part of an ongoing and well-planned campaign which includes a report called "Lowering the Bar" published by Dr John Logan of San Fransisco University, a seemingly credible figure, a website, and many interventions on Facebook and social media. An organized campaign designed to enable Deutsche Telekom's employees at T-Mobile in the USA to unionize and discredit the Company for allegedly not allowing them to do so. Why would employes have to resort to this sort of campaign for unionization? Freedom of association is one of the fundamental principles of the International Labor Organization and the United Nations Global Compact which Deutcshe Telekom declare support for. The German employee population are unionized and enjoy a strong position. What's the big deal here? Where is the truth ? The report, titled 'We take responsibility', claims that Deutsche Telekom is well on the way to adopting an international leadership role on sustainability and corporate responsibility and 'is making it easier for customers and suppliers to participate in modern everyday life with sustainable and international products, processes and services'..........The report has also been checked by the Global Reporting Initiative (GRI) for an A+ application level against the GRI G3 reporting framework. I wondered how materiality was assessed and if the Assurance process for this for the A+ report touched on these issues. Re Materiality - there is a nice materiality matrix which shows Employee Satisfaction and "Employee codedetermination and labor rights" in the top right segments, indicating high importance for the Company and for stakeholders, but, beyond the paragraph captured above, no further information. There is refererence to Group wide employee safisfaction but no disclosure of results. Re Assurance - PWC's pathetic assurance statement says "Based on our limited assurance engagement, nothing has come to our attention that causes us to believe that the data of the CR Report for the calendar year 2009 marked with the check symbol ( v) has not been prepared, in all material respects, in accordance with the GRI criteria." This limited, partial assurance, covering a small section of the report data , is not worth the paper it is written on. Now, what conclusions can we draw from this? One the one hand, a seemingly perfect and transparent performance by Deutsche Telekom in its reporting. On the other hand, a massive campaign which completely discredits the company's labour relations and human rights activities in the USA. Who should we believe ? The point is, really, that it is of no consequence who we believe. I am sure there are two sides to every story and I learnt many many years ago that things are not always what they seem, so on the issue of labour rights, I suspend comment and judgement. 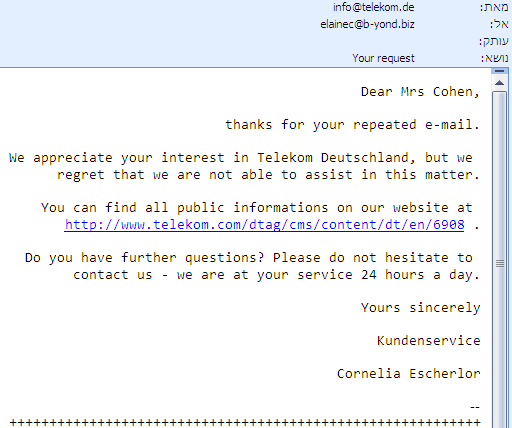 But on the issue of reporting, I believe Deutsche Telekom is abusing the system. This is clearly a visible and higly material issue. Even if Deutche Telekom believe they are squeaky clean in this respect, they should have made reference and provided a response in their 2010 report, in the name of transparency, and fair and balanced representation of their sustainability performance. Equally, the Assurance statement, which does not cover employee issues, is a farce. If you are a stakeholder in Deutsche Telekom, you should be bombarding the Company with requests for detailed information on labour practices. As I complete this post, I will also be writing to them to ask for their position on this issue. After all, what is sustainability reporting all about if not issues such as these? And what other issues are hidden behind the glossy texts ? The VRA is the New Big Thing in CSR report announcements. The first company to take advantage of this new service, the VideoReportAlert, offered by myself, together with CorporateRegister.com and 3BLMedia.com is Coca Cola Enterprises, the largest marketer, producer and distributor of Coca Cola products covering North America and Western Europe and selling 16% of Coca Cola volume worldwide. The Coca Cola Enterprises (CCE) report is their fifth CRS report. Yes, I did say CRS and not CSR, because CCE use Corporate Responsibility and Sustainability to refer to their approach and program. (though in this blop I will continue to refer to CSR, just because that's what I am used to!) CCE announce their report in the traditional way with ReportAlert, the leading CSR/Sustainability announcement service via email, and also using a VRA we specially prepared for them. The VRA video covers the key highlights of the report, though only a fraction of what I wanted to tell you about this report, as we didn't want to make the video too long. (After all, it's not Shrek 5). (Actually, before editing it was 11.5 minutes, so highly-talented 3BLMedia video-editor Gretchen had to trim it quite a bit. I could have done a feature-length video of this report, as it is packed with interesting information, so cutting down to a digestible 7.5 minutes was a real stretch.) Take a look here and then read on for some more insights. CCE serves 421 million people across 8 countries in North America and Western Europe, with more than 70,000 employees working at over 400 facilities. In 2009, CCE sold 41 billion bottles and cans of beverages generating $21.6 billion in revenues. This report represents the first year of CCE's reporting against Commitment 2020, their long range plan to achieve goals in five social and environment commitments. This is the most comprehensive and transparent summary of their CRS work to date. In addition to points made in the video, the out-takes include the fact that CCE is a champion of hybrid electric delivery vehicles, having increased their fleet on 2009 by 196 vehicles, and now operating 336 hybrids that deliver Coca Cola all around the country – and this is the largest fleet of hybrid heavy-duty vehicles in North America. CCE have worked on their water footprint, having reduced water consumption significantly, but also calculating their water footprint in a study of the amount of blue, green and grey and water used to produce and deliver a bottle of Coca-Cola in the Netherlands. If you don't know the difference between all these different colour waters, take a look at the CCE report. To explain the complex methodology, they have developed graphics that illustrate the amount and type of water used in each step of the process. Another thing I refer to very briefly in the video is CCE's Corporate Responsibility and Sustainability Action Week. This was a week packed with CSR activities designed to communicate CCE's CSR story, commitments, and goals to all employees and educate, inspire, involve and motivate them about the business, brands and CSR commitments of the Company. Employees and communities got involved in service projects, watched broadcasts of the Chairman and the CEO, John Brock, engaged in sustainability discussions, participated in virtual facility tours to see energy, waste and water sustainable practices. In Europe, there was a Carbon Challenge in which a group of employees measured and reduced their carbon footprint over a 4 week period and blogged about it, sharing tips for everyone. The power of digital communications and social media in advancing CSR clearly offers advantages. But the most significant thing from my perspective about this Action Week was that in a survey follow-up, 87% of employees said they knew more about CCE's CSR work, and 81% said they had a better understanding of what they could contribute to CCE achieving its 2020 commitments. It takes effort and investment to truly engage your employees. And with 70,000 people, and over 81% of them now confirming they will do more at CCE, it seems like this investment is worth the effort. I wish more Companies would be more proactive about engaging their employees - in fact, this is the subject of my book to be published in October and that won't be a minute too soon!(modestly:)). As with any CR report, we want to know not only what the Company has done but also what the company will continue to do. Clearly, no Company can do everything all at once, and focus and prioritization is necessary. This report visibly demonstrates Coca-Cola Enterprises’ long range view, though it does lack a materiality analysis or details of how stakeholder feedback was processed overall to help create the five 2020 commitments. CCE does report having tested the materiality of these 5 focus areas which were found appropriate by stakeholders, and also specifically addresses stakeholder feedback received on the last report. CCE's 5 core commitments take them right through to 2020. There is still clearly a long way to go, but the information in this report shows that CCE is taking steps in the right direction. CCE also produces several localized CSR reports as you can see here. I think it is important to ensure that local stakeholders in global or semi-global businesses can read about what affects them at local level. In producing a VRA for any company, my focus is on announcing the highlights of the report, not providing a detailed professional critique or recommendations for improvement. There is ALWAYS something of value in ANY report, and I have no problem focusing on this value in order to help generate awareness and hopefully, encourage people to read and take interest. CCE's report is a GRI Level B and also serves as a UNGC Communication on Progress. My overall impression was that the report is comprehensive, clear, interesting and balanced. MBA students from Georgetown University review the report in draft and offer feedback to CCE, which is a great process which the Company has adopted now for the third year. However, this does not subsitute a formal assurance process and I think some form of external professional verification would strengthen credibility. It is true, that as most reports, this one does focus on all the positive things that CCE is doing, and it is hard to find content related to the challenges that CCE may not be adequately addressing, which is why external professional verification would help. In addition, in this report, you can read about Plastic Fantastic with Carrefour, the Made in Wakefield campaign, the TMR process, the first global employee engagement survey, climate risks, zero accident rates in Pueblo Colorado, GLBT commitments, solar panels and pipes, motion sensors for equipment energy efficiency, levels of women in management (I ALWAYS look at that!) , Passport to Employment, Coachella LEED facility in California, how Peter Johnson at Sidcup saved 50 million liters of water and more and more. This really is an interesting report, and those of you who know me, will know that when I want to be critical, I don't hold back. But don't take my word for it, and don't hesitate to be proactive about telling CCE what YOU think. Let me start by saying that I admire any company who publishes a CSR report. I also admire companies who publish reports in English despite the fact that this is not their working language. As a linguist and polyglot myself, having lived and worked in at least 3 countries where I needed to talk, read and write in a language other than my mother tongue, and still do today, I know how tough it is to ensure that you can say what you want to say properly and accurately in a foreign language. I have understand those who make mistakes in the English language, as I do, frequently, in other languages I work in. But when a Company produces a CSR report in English which is badly translated and full of errors, I wonder what went wrong. I agree that substance over style should always guide us in our reading of CSR reports, and the OTE Corporate Responsibility Report 2009 , recently published, is actually a very nice, comprehensive, well thought-through report, and this is what counts. Most. However, the English translation is very poor and makes it hard to read, giving a slight impression of unprofessionalism. Here are just a few of the errors and oddities in their English language version. Can you spot them ? Aware of society’s calls, OTE has always offered a helping hand towards those in need. Page 1. Utilisation of the convergence of technologies by creating commercial proposals and the development of the customer offer by adopting new systems and procedures. Page 12. 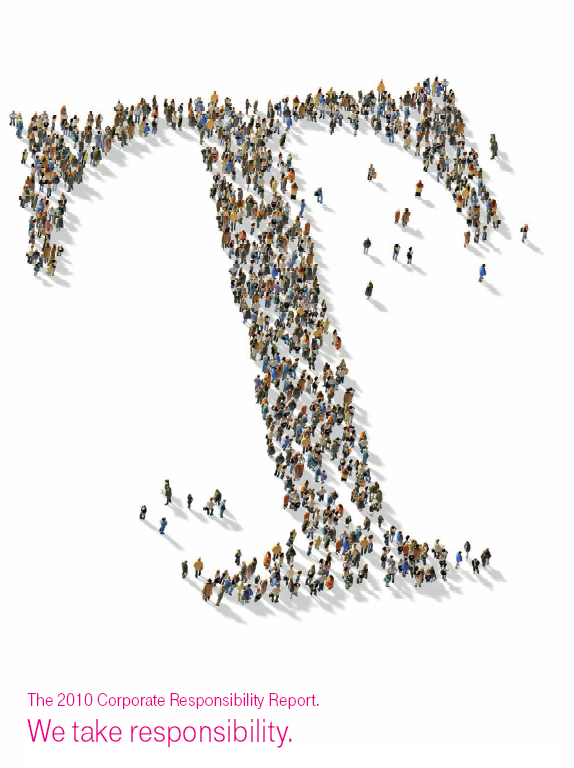 This is something we attend to address as CR is progressively integrated into OTE’s business planning, which should also help to foster necessary agility and cross-functional collaborations. Page 19. In order to ensure continuous and well-rounded information on CR developments, in 2009 OTE maintained participation in several national and international bodies as a member. Page 21. Until today, OTE gave emphasis to the development of the necessary infrastructure, even in remoted areas, so that all citizens can have access to the new technologies and specifically broadband. Page 34. All the complaints were handled with customer service as a guide and the average of written complaints that was answered within 20 days, was 92% while the majority of the verbal complaints were solved within 2 days Specifically: Page 35. At the same time we look for the design and development of products and services that enable our customers in reducing their environmental impacts. Page 56. OTE remained a bastion for vulnerable groups into 2009, by offering support to Non Government Organisations working in that direction. Page 67. The devastating earthquake in Haiti touched people worldwide, and the need for humanitarian aid to the victims, demanded from all people to become aware of this devastation and mobilise. Page 69. I see the needing for a more thoroughly proofing reading that we should look for in the next time this company is reporting.Oops. Sorry. It's the Chunky Monkey talking. In the area of climate change, Inhance contacted 8 companies who had declined to report to the Carbon Disclosure Project. "In particular we focused on the need for company boards to be aware of the evolving regulatory regime for climate change, and the opportunities in renewable energy, conservation and efficiency improvements." Inhance names the companies, but fails to report on whether there was any response to their contact, which is a shame. On hydraulic fracturing, the process used to release reserves of natural gas using high pressure water pumps, Inhance contacted six companies about their practice in this area, and received responses from three. Similarly, Inhance was active in the food area, contacting General Mills about misleading claims of reduced calorie breakfast cereals which were the result of playing around with portion size and not product modifications! Also, Inhance has taken up the use of BPA in packaging at General Mills and Pepsico. On diversity, Inhance engaged with five companies lacking in either gender or visible minority diversity at the board level. There are two points to make here, one good, one could-be-better. The good is that this sort of activity from Investment Houses and mutual funds is highly welcome. Inhance's proactive stance and reachout to companies is exactly what more investment companies and investors and analysts should be doing, as most public conpanies will "voluntarily" change only when they are given a little encouragement on behalf of people who want to invest in them. This is a critical route to more sustainable practices and I am happy to see Inhance reporting on this. It's the vigilante work of the CSR community. The could-be-better is that, having decided to produce a nice shiny report, couldn't Insight have gone the extra mile and reported on outcomes of engagement rather than just initiation? Wouldn't it be nice to know that all their hard work in talking to companies had actually yielded some benefit ? (assuming it did). Anyway, their report is a 13 page document which takes 5 minutes to read, but it's worth it. The principle of identifiying issues you feel strongly about and making sure companies know it is a golden rule of stepping up sustainability. Give feedback. Ask questions. Request change. I often get asked about how many of the Fortune 500 companies report on sustainability. I haven't seen a definitive number anywhere, so I thought I would check this out myself, perhaps starting with an analysis of the Fortune 100. I was happily working my way down the list, please to find in general that our leading business entities all have some level of CSR reporting, when I came accross Berkshire Hathaway Inc. whose website looks like it was built by a 6 year old some time in the 1920's. This company, as many of you may know, was founded and is run by the 80 year old Warren E. Buffett, the current chairman and CEO, one of the richest men in the world and, apparently, one of the most successful investors of all time. The Berkshire Hathaway company turns over about $30 billion and employs 287,000 people. It owns a long string of Companies, 10 of which are in the insurance sector, and the other 60 or so in a diverse range of sectors including textile and apparel, jewellry, furniture, gas, electricity, steel and many more. And now the moment you have all been waiting for: ESG, CSR, citizenship, sustainability, responsibility or any from of similar non-financial disclosures are conspicuously absent from any of Berkshire Hathaway's communications. The number 11 company on the Fortune 500 list is transparently non-transparent. Apparently, the company seems to be sustainable, since, from its beginnings in 1965, the book value of the company has grown by 20.3% compounded annually, whatever that means, but it sounds successful. Will the Company be sustainable after Warren Buffett ceases to manage it ? Who knows. But in the meantime, he appears to have led a very successful financial venture. In a A Special Global Pulse Report for the Boston College Center for Corporate Citizenship Corporate Reputation and Social Responsibility Rankings of The Most Respected U.S. Companies 2008, Berkshire Hathaway was ranked 9th out of a total of 203 companies anlysed. These rankings are not based on self-reported corporate information but over 20,000 ratings from people familiar with the company across the United States. What I want to know is: how do they know enough about Berkshire Hathaway to rate its workplace, governance, community contribution and leadership performance? (apparently environmental issues do not count in this index). Hmmm. 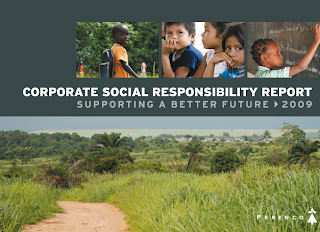 Some of the Berkshire Hathaway owned companies do mention CSR, sustainability or even produce a report on CSR. The Acme Brick Company devotes one full webpage to sustainability. The R C Willey (home furnishings) company has a page on charitable giving. The Mid American Energy Holdings Company has a full section on environmental efforts and community involvement, but doesn't disclose environmental data or report in any way. Clayton Homes has a webpage on giving back, and offers eco-environmentally friendly e-homes. General Re takes CSR very seriously.. ahem... as can be seen from their couple of paragraphs on this subject. NetJets have a carbon offset program .. grrrrrrrrrrrreat! Shaw Floors, who have a fully-fledged real genuine Sustainability Report for 2008. Interestingly, there is an opening message from, yes, you guessed it, Warren E. Buffett, though he doesn't say anything remotely connected to the concept of sustainability. The report is a first report and nicely done. Well, all I wanted to say, really, is that it astounds me that there are still leading, influential, financially successful businesses such as Berkshire Hathaway, with the potential to do so much to engage 257,000 people in over 70 companies in a sustainability mindset and don't. Even some basic things such as a common sustainability charter for all Berkshire Hathaway businesses, or attention to very basic direct impacts would be a good start, let alone the potential to develop business opportunity and advantage. Is Warren E. Buffett missing a trick here ? Or is he cleverer than most? Is his financial leadership so powerful that it blinds all stakeholders to all other aspects of doing business ? I dont know the answer. But it just makes me a little sad that we don't see sustainability leadership from the direction of the Buffett empire. Is any report better than no report ? Is it worth producing a CSR report when you have no data to report or is it better to wait until you have more performance to share? I will illustrate my answer to this question with a look at Perenco's first Corporate Social Responsibility Report for 2009. Perenco is an independent Anglo-French oil and gas company with onshore and offshore operations in 16 countries, ranging from Northern Europe to Africa and from South America to the Middle East. The Company is present in exploration basins such as Brazil, Peru, Northern Iraq, Australia and the North Sea. The company was founded in 1975, has about 4,000 employeees and around 250,000 barrels of oil production per day. And now they have a first corporate social reponsibility report.Of sorts. This publication demonstrates how far this Company is from understanding what CSR and sustainability really is, where it impacts their business and how to communicate it. Despite the CEO opening message "Our stakeholders, including employees, governments, partners and financing community, are showing an increasing interest in understanding our CSR activity. It is becoming extremely important to better explain our strategy, and to show tangible examples of positive social actions. At Perenco, we have never seen CSR simply as a way to maintain the company’s short-term reputation. ", there is little in this "report" to satisfy any stakeholder or to assist in undertanding the Company's CSR and sustainable development activity, beyond a few nice stories. This is not a report, there is not one piece of performance data or any of the elements we would consider representative of a "real" CSR report. What prompted this Company to publish this simplistic kind of document ? Do they not have any performance data they can share ? No calculation of any of their social or environmental impacts ? Do they really think that CSR is just about observing the law, applied ethics and community contribution? Do they understand the concept of transparency? Do they think this improves their reputation or builds trust ? I will, of course, write to them to give my feedback (despite the lack of a contact point in the report) , but in the meantime, I revert to my opening question. Is it worth producing this type of document or better to do nothing? My view is this: it is always better to produce any type of report, however inadequate it might be. This document shows that this Company has an initial awareness of the concept of CSR, however basic. If this is the best they can do, so be it. For now. At least it is a written commitment of their position on a number of important CSR issues. Someone has made an effort. It does show some sensitivity for managing impacts and behaving responsibly. This report, at least, serves as a basis for feedback and dialogue and the very beginning of a willingness to disclose, whatever might be prompting this. There are many who might say that this kind of reporting is a waste of time and gives reporting a bad name. But I always prefer to see the opportunity rather than the loss of opportuntiy. Perenco shows us with this first publication that they have a real opportunity, and perhaps a need, for a comprehensive RATS programme: Responsibility, Accountability, Transparency and Sustainability. A light interlude for those suffering from post GRI conference blues. 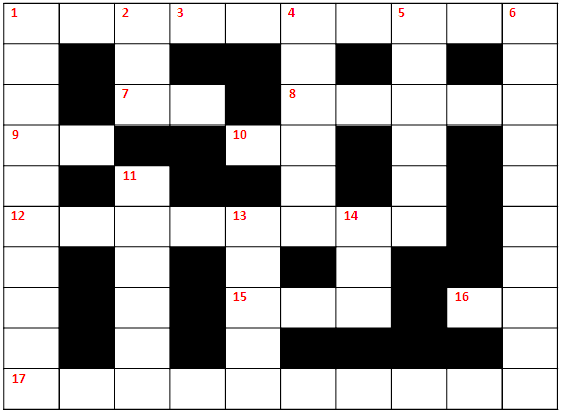 Here is the official post-GRI-conference crossword. Accross: 1: Integrated. 7: Oy. 8. Press. 9. EN. 10. So. 12. Rewrites. 15. Tag. 16. Su. (sustainability, hahah) 17. Disclosure. Down: 1. Integrated. 2. Two. 4. Report. 5. Tweets. 6. Disclosure. 11. Awards. 13. Intel. 14. ESG. A Brazilian delegate at the GRI conference told me that she was quite embarrassed at the knockout performance of the Brazilian reporters in the GRI Readers Choice Awards 2010. Actually, it may even have been an embarrassment for the GRI as well, perhaps intimated as such by Hermann Mulder, member of the Awards Integrity Team who said the team met five times and worked to a process which was "as good as it can be". As good as it can be does not necessarily mean good. A process which delivers four reports, all from Brazil, for six awards, out of a possible 1,100 reports which received votes, of which 105 were shortlisted, from 13 countries, must beg some questions. Out of a total of 30,546 votes cast, Brazilians voted 22,613 times - 74% of all the votes. The next highest voting country was the USA with 2,107 votes, then India with 1,981 votes, then Greece with 1,288 votes. All other countries cast less than 1,000 votes, with the Netherlands, home to the GRI, with a mere 57 votes! !, the lowest number of all. Data from CorporateRegister.com shows that Brazil is the 13th reporting country in terms of number of reports issued per year, with about 100 or so reports issued annuallly, way behind European and North American levels. So how did this happen ? What magic inspired over 22,000 Brazilian votes ? 3,724 individual Brazilians were reponsible for these votes - that's 72% of voters and an average of 6 votes per person, whereas the rest-of-the-world appear to have an average voting rate of 5 per participant. Not such a big difference, unless there are very wide variations withing the averages. And even so, mobilizing so many voters to get online and "do it" is certainly an achievement worth recognizing. Notwithstanding, I believe it would be appropriate, in the interests of transparency, for the GRI to disclose the distribution of average votes per person in each country. Just so that we can pronounce Brazil the reporting rulers of the world with a clear conscience in the knowledge that this was about quality reporting and not exploitation of the system by an enthusiastic few. Banco do Brasil - Relatorio Annual 2008. This is an annual combined financial and non-financial report hosted in the Investor Relations section of the bank's website. It is an html mini-site which is attractively designed and uses automated people who speak to you (in the local lingo with English subtitles) and provide you with the option of choosing your profile - employee, customer etc -for a tailored reading experience, or going directly to the the entire report content. The PDF download of this report is 539 pages! This is not a report, it's a library. It includes everything from a history lesson, "Napoleon sweeps the continent with its armies, dethroning monarchies and installing republics." in 1808, to all the detailed financial statements you would expect in a financial report, macroeconomics, microeconomics as well as sustainability information, with the resepective GRI indicator noted alongside each section of text. The main sustainability section is in a chapter of its own, 38 pages, though some of the Profile Disclosures are threaded throughout the report, plus around 20 pages of GRI Index. Whilst it seems that this report cannot be faulted for transparency, I must say that it is not one of the most pleasurable reading experiences, though the English translation is unintentionally mildly amusing :) If you like numbers, this is a report for you! Banco Bradesco Sustainability Report 2008. This report also won in the Best Assurance category in the CRRA 10 Awards. It's a GRI A+ level report of 148 pages in length. It's nicely designed and carefully written. The bank employs over 80,000 people with over 40% of women in management positions. Clearly, an enlightened organization :). In addition to the content in the body of the report, there are around 50 pages of "additional content" which zoom in on different aspects of the bank's activity and performance for those interested in greater detail - a nice touch! The report includes details of the Banco Bradesco "Cycle of Dialogue" with stakeholders and feedback received on their 2007 report. Atfter a brief look through, this seems to me to be an impressive report. Vale Sustainability Report 2008 : This is a second report at GRI level B+ of 117 pages in length from this mining company with a mission to transform mineral resources into prosperity and sustainable development, employing over 145,000 people. The report is also clear and nicely designed and includes interesting references to indigenous communities and quilombolas and other informative stories. The Vale report appears to cover key sustainability themes and includes an interesting graphic presentation of the material issues. Natura Cosmeticos Annual Report 2008 : This is a nicely philosopical (life is a chain of relationships) report, (commitment to the truth is the route to perfecting the quality of relationships) for this 40 year old company with 5,500 employees, and is their ninth sustainability report, containing 14 pages of financial statements, out of a total 49 pages. 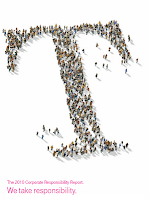 (It is in the heart and in the eye of each one of us that change is built) It is a GRI A+ report with both financial and sustainability content assured by separate assurers. It doesn't shy away from talking about "controversial ingredients" and in general this report is written in a frank and direct manner, adressing sensivtive issues such as layoffs , accidents and the challenges of diversity. Quite a readable report, actually. So, all in all, four relevant and serious reports were selected. One cannot say that the awards were made to reports that were not worthy entrants. And you should not mistake my criticsm of the awards process for sour grapes because my predictions weren't entirely correct ... ahem.. even though I did pick two out of the four winning companies though not in the right categories. Leon Kaye takes this positively in his editorial for Justmeans , saying that Brazil can "provide a teaching moment for companies around the world" . I am sure this is true. I am just not quite sure what the lesson is. Fernando Legrand also says Brasil (e India) se estaban convirtiendo en ejemplos a seguir por las empresas de Estados Unidos. Hmm. I am sure all the American reporters will like that! Leon Kaye says the Brazilian showstopper is evidence of "Brazil's remarkable influence on the world economy and concern for sustainability." Is he right ? They certainly have some clout - according to Forbes list of the biggest companies in the world, Petrobras (2008 GRI Awards winner) is #18, Banco Bradesco #51, Banco do Brasil #52 and Vale #80. And I guess I would rather they were leaders in sustainability than not. But Antonio Vives, who takes a "mirada critica" (I think this means a critical look ?!) at CSR, oops, RSE, is not convinced, calling the Brazilian victory a "falacia" (guess that one yourself). Let's hope that this win encourages more Brazilian companies to report, and more countries and voters to get into the compeititve spirit and make best use of the two years until the next Awards Gala to boost their sustainability leadership and RATS: Responsibility, Accountability, Transparency and Sustainability. Hold one Readers Choice Awards for Brazil and one for the rest of the world, in the interests of diversity - a concept fundamental to sustainability. Announce now the results of the 2012 Awards (Brazil takes all!) and avoid all the hassle of mobilizing votes, in the interests of energy and resources savings. Limit votes to 3 reports per person, where no-one can vote for their own report, in the interests of the abundance mentality. Make award categories for regions, and allocate a winner for each region, in the interests of well, regions. 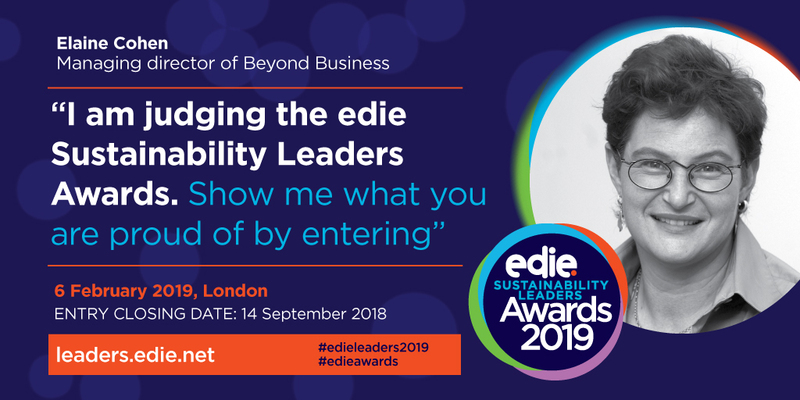 Make award categories for company size, or type (for profit vs not-for profit) so that the Awards will be inclusive - another sustainability concept critical to the development of diversity. Invite only Brazilians to vote, but for not Brazilian reports.This could be called the Brazilian Choice Awards. Maintain the Awards in exactly the same format but accidentally on purpose block all Brazilian IP's. This could be the Brazilian No Choice Awards. Which option do you prefer ? You can vote only if you live in Rio.